I know of one so far, let's see if more show up. Anyone reloading and shooting an American ranch rifle .. if so do you have any info to share ??? ie powder, bullets etc. Just got my Ruger ranch out of layaway. Only ran 10 rounds through it so far. Very pleased. Recoil very tolerable. I'm shooting the Hornady custom 250 grn ftx. I hope to stretch it out to 100 yds if the weather permits today and start dialing it in tight. So far I like what I'm seeing though. I want to shoot cast bullets, both for economy and because they work well on game in my 454 rifle. I know the 450 can surpass the 454s ballistics if needed. But truth told, I have never needed more than what the 454 brought to the table. BUT, all jacketed loads where MOA or less. WORST of the bunch where factory 250. But at just over 1" it was no slouch really! what was group size with those cast bullets? For the record. Its not against forum rules to resize your images before you upload them. 1024x768 renders well on the forum. Al in Mi wrote: what was group size with those cast bullets? I only shot the 255g it was 13x16"..... @ 50 yards. Hoot wrote: For the record. Its not against forum rules to resize your images before you upload them. 1024x768 renders well on the forum. I don't know your resolution.. but these pics fit my screen fine, no scrolling even close to required...They are about 1/3 of the frame. Hi, I am new to this forum, and I would like to know if anyone has sized a 500 grain .458 to 452 and shot any test loads. Thank you for checking this out. 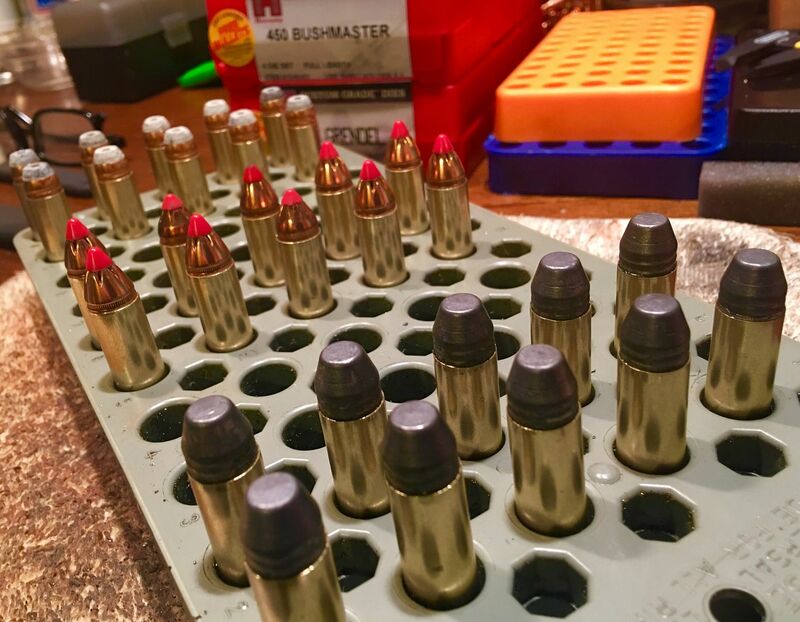 Animos wrote: Hi, I am new to this forum, and I would like to know if anyone has sized a 500 grain .458 to 452 and shot any test loads. Thank you for checking this out. Sorry no I have not seen folks doing this. Such bullets are more popular in the SoComb as it is also used with subs and different faster twist barrels.